The frame number is located different places depending on the model you have. If you have a trailer from us, the frame number is located on the side of the bottom frame. If you have one of our cycles, you first have to stand behind the rear wheel of your model. 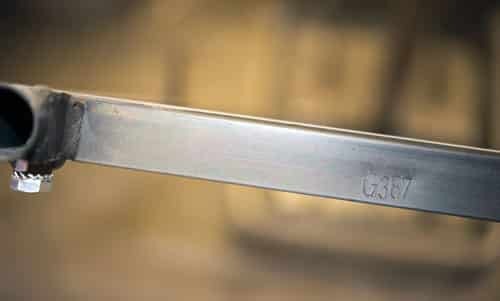 On pre-2000 models with double tube frames, the frame number is engraved on the left side of the plate that joins the upper and lower tubes. The frame number is never on the right! On the mono-tube frames, the frame number is on a plate under the bottom bracket. In powder coated light models, the frame number is also painted on the seat tube well below the saddle – again on the left side! Please also see the following images. What is the frame number? Each cycle and trailer from us has it own unique number, which is named a frame number. 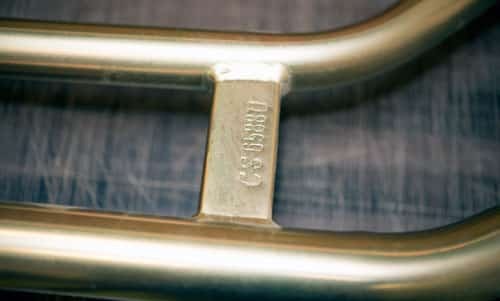 Our frame number consists of our own manufacturing stamp (CS), a serial number, and a year number (the last letter). We keep records of all our models with the use of the frame number. How old is my model? If you send us your frame number, we can give you an accurate date about when your model was manufactured. You can also look on your frame number. The last letter in your frame number indicate the year the model has been manufactured. You can use the following guideline to find the year of your model. The letters A-Z are used excluding I, O and Y. Why is it called Christiania Bikes? Our company was founded in the Christiania Blacksmith in the seventies. We started to make cycles to the community and it came very natural for all of us to call us Christiania Bikes. We have been using this name, which also is a registered trademark, since the eighties. When was the first model launched? The first model we launched was our trailers. They were launched in 1978. Our first cargo bike was launched in 1984. How many children may I carry on a model? There are small differences with each country’s regulations regarding the number of passengers. We adapt our models to comply with local regulations; please consult with your dealer for more info. Do you follow any standards? Our electric versions are classified as EPACS (Electrically Power Assisted Cycles) with a maximum speed of 25 km/h and a maximum continuous rated power of 0.25kW. These types of cycles must comply with The Machine Directive 2006/42/EC. To comply with this directive, we follow the European Standard EN 15194 and thus also, among others, the EMC directive 2014/30/EU. To comply with these Directives, we do both our own test results as well as independent institutes in Denmark. All our products for children comply with Directive2005/84/EC insuring children are not exposed to reprotoxic / hazardous substances. Where can I get my model serviced? We recommend to receive service from one of our authorized dealers. You can find a list of our dealers her. How frequent does my model need service? The frequency of service should be commensurate to the use of the model. So, if you use your model every day in hilly areas and for heavy transportation, your model should be frequently serviced by your dealer. Mainly to check the brake system is working properly. With that said, a common rule of thumb is to service your model two times a year. Inspect for wear and cuts on the tyres. Tyres shall be inflated to the recommended pressure. Please check all the tyres and ensure the tyres are inflated to the recommended pressure. You can find the recommended tyre pressure by inspection the tyre. Check wheel bearings for play. 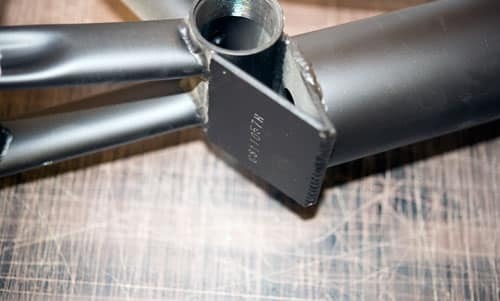 Regularly clean off dirt from the frame, wheels and box etc., using a damp cloth. Regularly inspect for loose parts and get them tightened by your dealer. Lubricate all visible moving parts, cables, adjusting screws, moving brake parts (NOT brake discs), chain, pedals, bell and lock regularly with bicycle oil. Bolts and nuts also like a few drops of oil. Check that the chain has the right tension. It is recommended to regularly wipe the inside and outside of the box with a damp cloth. If the box is standing outside, it is recommended to use a cover to protect the box against rain. The box can be sealed with a thin film of linseed oil applied using a cloth. Linseed oil can also be applied to the wooden bench. Our fabric can be hand washed in lukewarm water (max 40 °). Excessive washing weakens roof’s impermeability. Best is to wipe it lightly with a damp cloth or sponge. The brake system is very important to maintain regularly to insure you, your children as well as others safety. For highest safety, our brake systems should only be maintained by qualified technicians. Please consult your dealer if the braking power is weakened, or the brakes are not braking equally. How to load the box? Please load the box with care. We recommend to always store the load and especially the heaviest load as close to the gable (next to the handlebar) as possible and lighter items in the front section of the box. When turning, sit up straight and let the front part turn, maintaining the weight on the inside wheel. Do not ride too fast, keep the bike under control. Do not stand up while riding, as the cargo bike could wobble. Do not roll backwards sitting on the bike, it may damage the rear frame. Our models shall not be considered nor treated as racing or road bikes. Our models are especially made for people transportation and for business use. How to protect your model against theft? Fit an approved frame lock. Get an extra chain lock for extra attachment. Lock the model to a stationary object. Take photos of the model and the frame number. We strongly recommend to arrange an insurance for you model. If disaster strikes and you have your model stolen, insurance companies usually require the frame number of the model and the proof of purchase. Please consult your insurance company for further information.